The agency’s green lending program, which requires owners cut energy or water by 25%, is proving to be very popular. 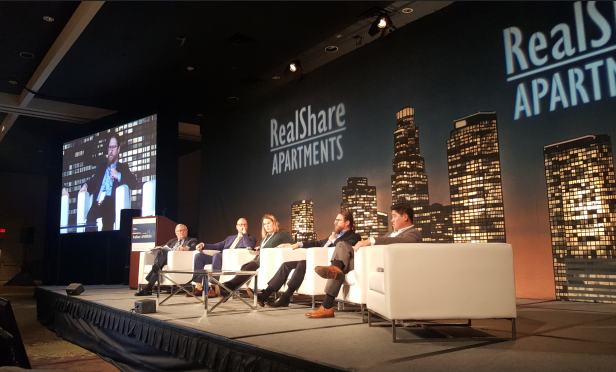 Fannie Mae’s green lending program is proving to be very popular, according to speakers on the Sustainability, Green Financing & Affordability Outlook panel at RealShare Apartments. Panelists—which included John Powell, EVP at Bellwether Enterprise; Jay Donaldson, President of the Fannie Mae and FHA platform at NorthMarq Capital; Molly Simpson, manager of green financing business at Fannie Mae Multifamily; and Paul Volkoff, national sales manager at Homasote and Tony Liou, president at Partner Energy—discussed the benefits of green lending and why it has become so popular for the agency. It has been an interesting evolution for the agency. Fannie Mae’s green lending program originally launched in 2012, but it only grew to immense popularity in the last two years. The program requires that property owners reduce energy or water consumption—they can choose—by 25% to qualify, and it comes with major incentives, including the ability to underwrite the utility cost savings and Fannie Me reimburses for 100% of energy audit costs.